Violinist Jesse Irons enjoys a busy and excitingly diverse musical life in and around his home city of Boston. A member and co-artistic director of the GRAMMY-nominated ensemble A Far Cry, he has appeared in concert across North America, Europe, and Central and Southeast Asia. Jesse’s playing has been described as”insinuating” by the New York Times, and he’s pretty sure they meant itin a good way. 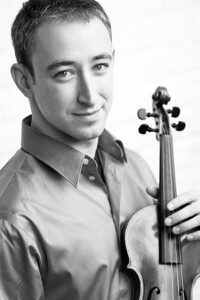 Jesse’s baroque violin-playing alter ego appears regularly with the Handel and Haydn Society, as guest concertmaster with Boston Baroque, with the Boston Early Music Festival, and with numerous small ensembles including Gut Reaction. He has recently appeared as soloist with Newton Baroque, Sarasa, and Chicago’s Baroque Band. As an educator, Jesse has worked with students on entrepreneurship and chamber music at MIT, Yale, Stanford, Eastman, Peabody, and New England Conservatory.